In a demanding and fast changing environment as is the Chinese market, Human Resources have become a strategic imperative for German companies. A notoriously competitive talent market, rapid salary increases, and high employee turnover are among the top business challenges. Companies that have recognized this fact and consider having a strong engagement from their top management can gain a long-term competitive advantage. In order to support those companies the Delegation of the German Industry & Commerce, the German Chamber of Commerce and DEinternational Shanghai jointly organized “China HR Tomorrow”. The Summit serves as a platform for top management and HR executives to discuss cutting-edge approaches and solutions as well as learn from the best and most experienced practitioners in the field of Human Resources Management in China. 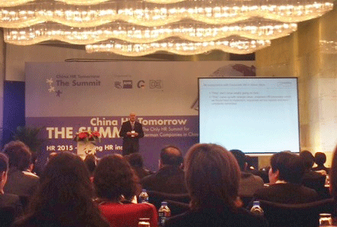 Our Shanghai-based executive search team joined the event to keep up with the latest HR trends in China.